I know this person - let's call him Uncle - who once asked me, "Which SUV do I buy? I want very good ground clearance! That's the most important thing." "Well Uncle, if you're looking in the Rs 20+ lakh segment, then the Toyota Fortuner is pretty good in that department," I replied. "What? Fortuner? Ha! That's not enough. Tsk tsk," he scoffed. "Well, Uncle, then Ashok Leyland or Tata Motors has the perfect truck for you," I said. Okay, that's what I wanted to say, at least. Clearly there's no such thing as too much ground clearance for a lot of people in India. And that brings us to the Volvo S60 Cross Country. So, what is it then? 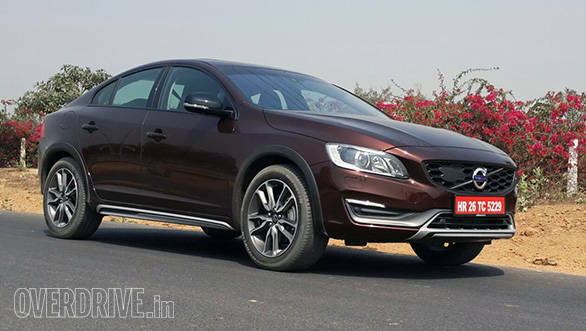 It's essentially a standard S60 that is now pretty much India-proof. 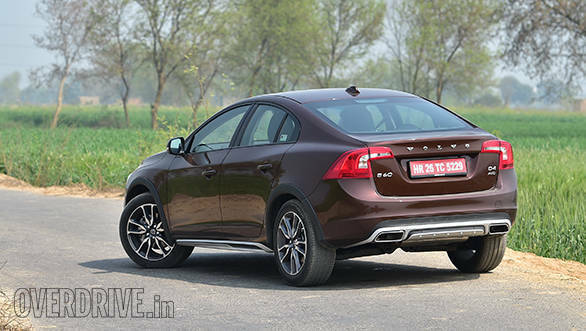 But does the Cross Country badge add enough to S60 to get the attention of the rather fussy Indian market? 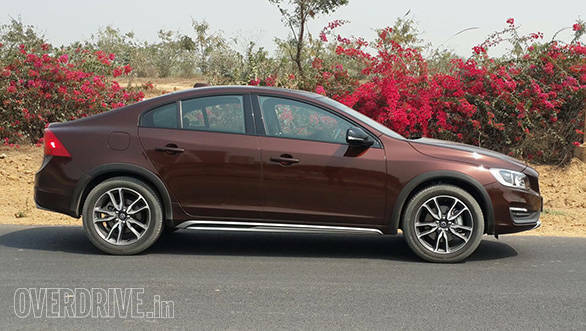 The first difference you'll notice about the Volvo S60 Cross Country over the standard car is the increased ride height. The Volvo S60 Cross Country's 201mm of ride height is just what's needed to keep you happy as you drive over those nasty potholes and ridiculously high speed breakers. Oh, and Volvo has added a neat set of new wheels which are larger and shod in higher profile tyres - both of which contribute to the additional ride height. 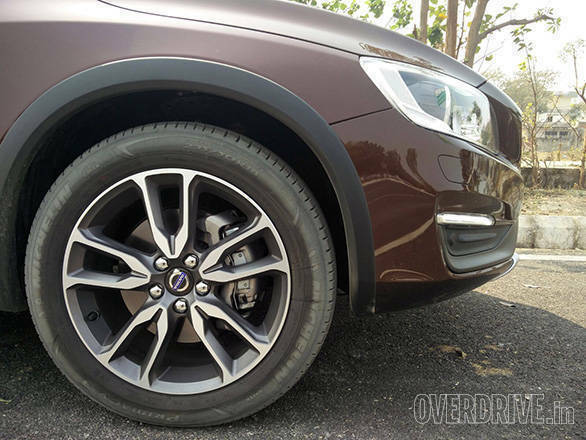 The Volvo S60 Cross Country gets 235/50 section tyres, which means you don't have to worry too much about silly punctures. I was a little on edge while going off tarmac initially, but seeing how comfortable the S60 Cross Country was, I eased up a bit, let loose and started to have some fun. Now usually increasing the height of a vehicle has one of two consequences - a lot of body roll or stiffer suspension. 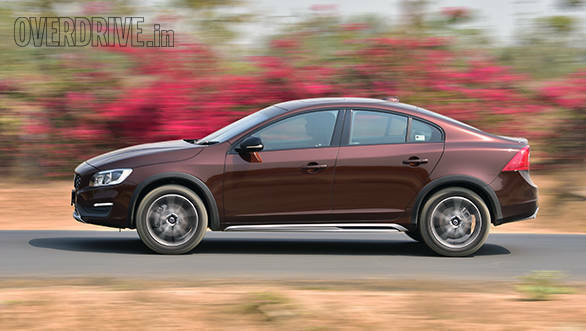 The Volvo S60 Cross Country has the latter to compensate for the increase in suspension travel. While I'll admit that handling hasn't deteriorated by a lot, I find that the ride quality is a bit too stiff. So while you're smiling about not having to deal with a damaged underbelly over bad roads, you'll have to do it with an aching back. It's just one of those compromises you'll have to live with. The Michelin Primacy 3 tyres meanwhile, manage to hold their own despite me pushing quite hard. However, the car does have a slight tendency to understeer. The electrically assisted power steering unit is quite light at slower speeds, and artificial weighting kicks in when you pick up the pace. It is quite sharp and unlike most electric steerings, this one offers pretty good feedback. The car also feels quite planted and despite hitting a couple of small crests on the highway at high speeds, it didn't quite lose its composition. 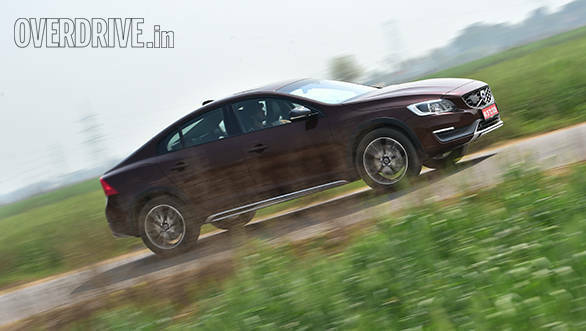 That said, the Volvo S60 Cross Country is most comfortable at around 150-160kmph. The engine meanwhile is quite the charmer, especially in the city. 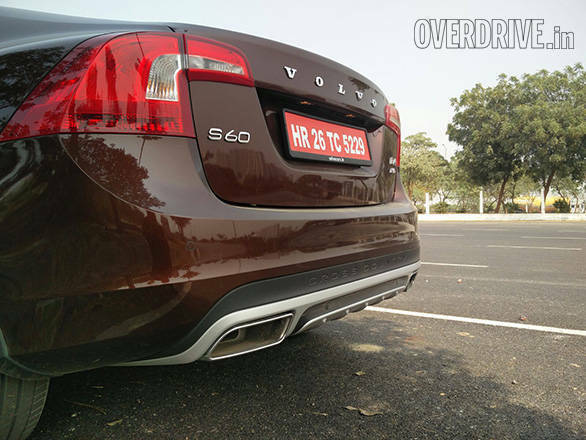 The Volvo S60 Cross Country gets the same 2.4-litre turbo-charged five-cylinder diesel seen in the standard S60. 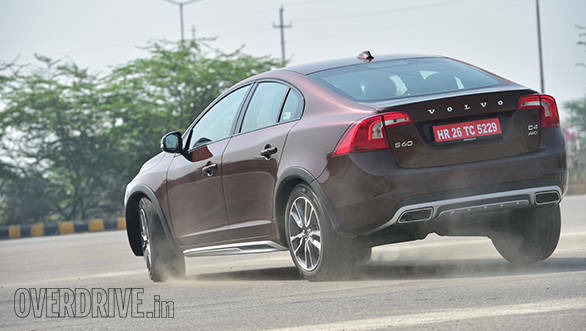 However, Volvo has detuned it to make 190PS and 420Nm instead of 215PS and 440Nm, and is also offering all-wheel drive as standard on this model. The all-wheel drive system mostly powers the front wheels and sends power to the rear only when it detects loss of traction. The power delivery is very linear and there's absolutely nothing intimidating about it while driving around in heavy traffic. This engine is mated to a very nice six-speed automatic which upshifts and downshifts with no hesitation whatsoever even without engaging Sport mode. When you do engage it however, the car immediately livens up, improves throttle response and shifts up later. This is when you'll hear that five-cylinder diesel sing out in its deep rumbly voice. There are a couple of issues with the engine though. Although it is pretty quick with a 0-100kmph time of 8.4 seconds, it doesn't feel quick enough to excite you. Don't get me wrong here; this car will do everything you ask of it including quick overtakes and delivering power with almost no delay. However, it just didn't manage to put a smile on my face. I also have to mention that a fair amount of vibrations crept into the cabin while idling. Volvo has said that it will be phasing out this engine in 2017 for a more efficient Drive-E four-cylinder motor. The only reason it hasn't been done as yet, is because Volvo is still configuring that engine with the all-wheel drive system. But until then, this isn't such a bad deal as it managed to give me 11.1kmpl in the city and about 17.2kmpl on the highway. Most Volvos, especially the current generation models, really tend to stick out of the crowd. Apart from the obvious increase in height, the S60 Cross Country has a couple of other subtle changes to set it apart from the standard car. And I must say, it does seem to have a lot more presence. The black bumper extensions, scuff-plates and the honey-comb grille certainly give it more rugged look to go with the whole cross-country theme. This might just strike a chord with Indian customers who have a thing for these SUV-like design elements. Although the dimensions would appear to be the same, the S60 Cross Country is about 3mm longer, and 42mm wider than the standard S60. The 65mm increase in ground clearance translates to the obvious increase in the overall height. The interior which sees no significant changes over the standard S60, is very neat, but with a slightly cramped centre console. The front seats meanwhile, are great and offer sufficient bolstering to keep you in place. The rear seats however, aren't the most comfortable with barely any underthigh support. When you open the boot, you'll find a space saver ironically occupying quite a bit of space, so we suggest you pack light for a long road trip. All that being said, the Volvo S60 is still a bit outdated in terms of design. Sure, the Cross Country badge adds some flavour, but that doesn't change the fact that it's still essentially the same design that's been around for almost five years. While Mercedes-Benz and BMW have been constantly updating the C-Class and 3-Series, Volvo seems to be quite content with their design even after all these years. This applies especially to the interior. To put it in perspective, look at the Mercedes-Benz S-Class. It's got a fantastic interior and the good thing is that a lot of these elements are carried over to the C-Class. Now when you look at the Volvo XC90's beautifully crafted interior, and then step inside the S60 Cross Country, there's almost no resemblance. And that's one element I'm not too happy with. 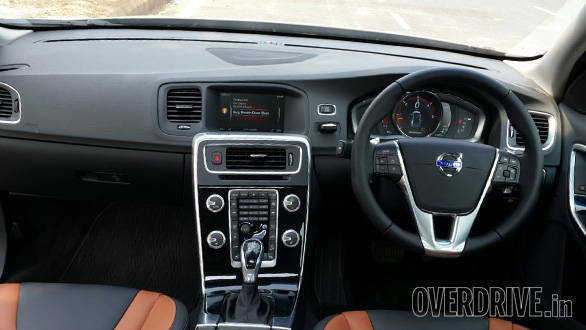 Well there's just one actually - the Volvo S60 Cross Country Inscription - which comes loaded with all the features and safety equipment offered in the standard S60. 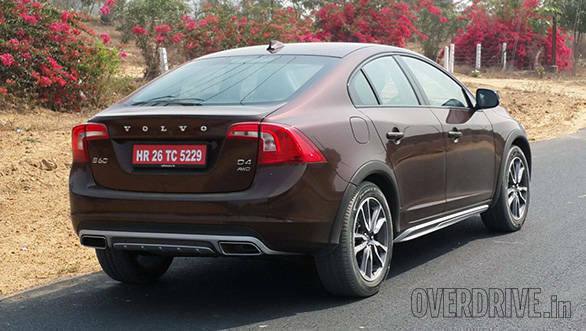 Volvo has certainly added some value to the S60 with the Cross Country variant. It now looks better, is more practical and basically has more appeal. At Rs 38.9 lakh (ex-Mumbai), you get a pretty good compromise between a sedan and an SUV. Depending on how well the Cross Country does, Volvo might even replace the standard S60 with it. Even if it's a bit outdated in terms of design, it still looks good and it surely drives well too. While it might not have enough ground clearance for Uncle, it should be more than enough for any reasonable Indian.